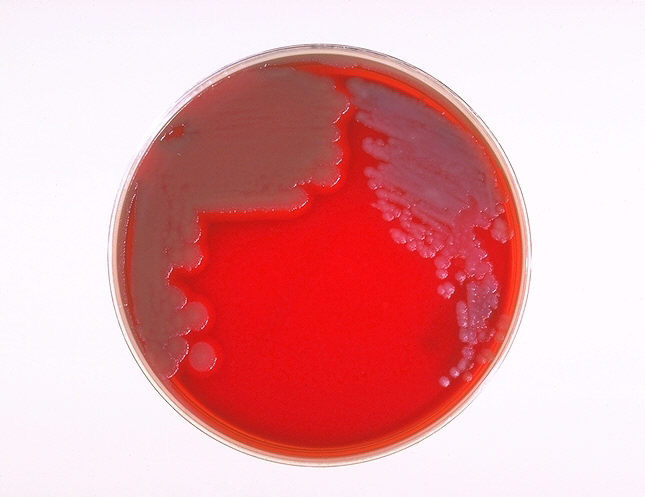 Several nonselective and selective media for the detection and isolation of Bacillus anthracis have been described, as well as a rapid screening test for the bacterium based on the morphology of microcolonies. Table 1 provides the differential characteristics that are used to distinguish Bacillus anthracis from most strains of Bacillus cereus and Bacillus thuringiensis but not necessarily from other saprophytic species of Bacillus. Otherwise, it is not the intent of this article to provide information on the growth of the bacterium in the laboratory. The following figures (5, 6, and 7) from the CDC are reliable images of Bacillus anthracis grown as described in the figure legends. Figure 5. 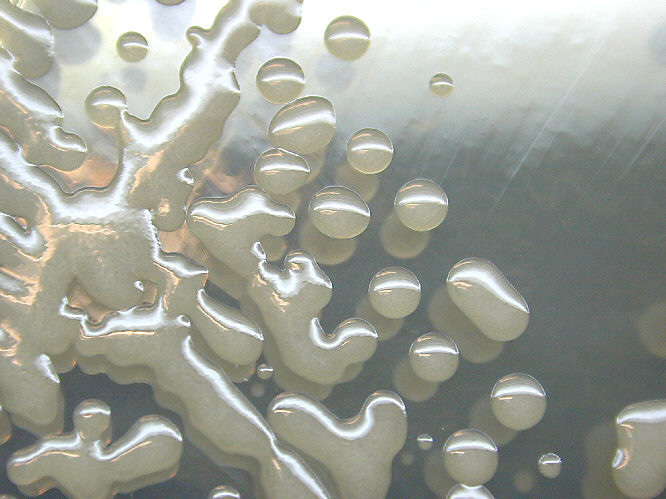 Colonies of Bacillus cereus on the left; colonies of Bacillus anthracis on the right. 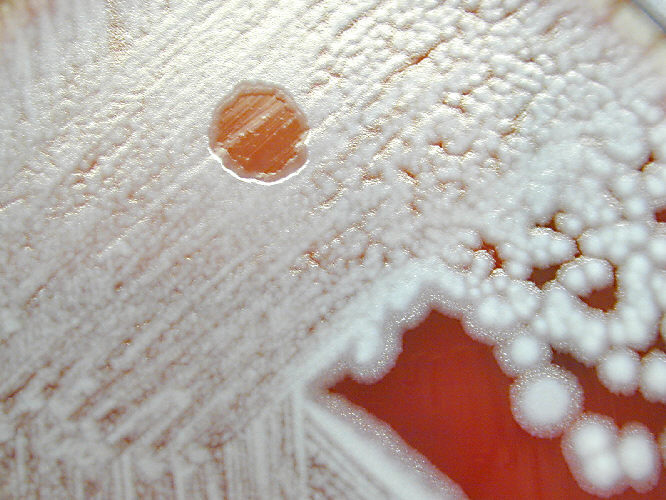 B. cereus colonies are larger, more mucoid, and this strain exhibits a slight zone of hemolysis on blood agar. Figure 6. Lysis of Bacillus anthracis by the lytic phage gamma. The plaque (clear area) in the region of confluent growth is where the gamma phage was applied. The plaque results from the phage's ability to lyse the bacterial cells. Since the gamma phage is specific for B. anthracis, and will not lyse B. thuringiensis or B. cereus, we know that this is Bacillus anthracis. The colony type of is similar to Figure 5. Figure 7. Mucoid colonies of Bacillus anthracis. This culture was probably incubated at an increased CO2 tension (5% CO2) which greatly enhances production of the poly-D-glutamyl capsule and accounts for the mucoid colony type.